ForCharlie's kaBOOM! Charlie's kaBOOM! to avoid problems. So easy to use - Just screw the cap on a cola bottle, attach a string to make certain the cap cannot get lost, PUMP it UP and Shoot it. A reusable premium rubber valve installed in a custom designed heavy duty cola cap that is used to pressurize bottles for target shooting or just making noise. 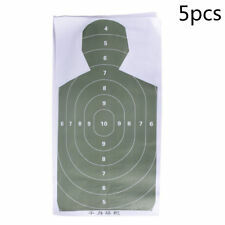 Ideal s ilhouette paper targets for a rchery, shooting,training. PERFECT for shooting indoors or outdoors, short range or long range. Type: Silhouette T argets. 5 Pieces Silhouette Paper T argets. Material: Paper. 25-50 mbar en 11 positions. 70 Targets with 3 different sizes Bulleyes Neon Orange Self –adhesive Target stickers for Shooting. You can stick it on any surface. Make anything into a “ Target”. Type: Target stickers. 5 Target stickers. Brand new and high quality;Self resetting air rifle target set;Great for practice or playing. Self resetting air rifle target set;Suitable for 22 Rimfire;5 targets to aim at. Size: W: 27 x D: 20cm x H: 36 /10.6 x 7.9 x 14.1inches;G.W. : 0.91kg /2lb. Comes with 10 target stickers;Easy to set up - No need to assemble. Packing List: 1 x target set 1 x paper sticker(include 10 pcs stickers). Our targets are EXCELLENT for target practice, shooting competitions, self defense and concealed carry training. The yellow bullet holes are visible in all light conditions without the aid of binoculars or spotting scopes, great for people with reduced vision. 1/2" AR500 Steel Plate Target. -Manufactured from new high quality AR500 steel plate made in the USA. 8" Gong Style Target. -Targets are not painted. They will be in raw steel form. -Minimum distances from steel targets to shooter are 10 yards for pistols and 75 yards for rifles. SWISS ARMS Cible métal carrée pour BB's 6 mm,Utilisation pour Airsoft 6mm ou Airguns 4,5 mm. SIMPLICITÉ ET SÉCURITÉ. These targets are blemishes meaning they could have inferior hole or edge quality. Manufactured from new USA Made high quality AR500 steel plate. Not cheap import material. -3/8” AR500 steel targets work great for the following calibers 223, 5.56, 5.45×39, 7.62×39 and 308. No Steel Core Rounds should be used! ForCharlie's kaBOOM! Screw Charlie's kaBOOM! HOW MUCH PRESSURE?. Unlike pop bottles that are standardized there's a zillion types of water bottles and many are different. But there's one more consideration. La description:Matériel: XPECouleur: noir vertTaille: (L) X (W) X (H) 23X23X23cm /9.06''X9.06''X9.06''(appr. )Caractéristiques:Tout neuf et de haute qualité.1) Venez avec la prise de vue 18-côtés pour la vie augmentée de cible.2) Conçu pour les amateurs de tir à l'arc, le meilleur choix pour eux.3) Fait du matériel de XPE, longue vie, non-toxique, léger et portatif.4) conception de densité multi-couches pour arrêter les flèches avec le frottement pas la force permettant l'enlèvement facile de flèche.5) Peut rouler sur le sol, placer sur une surface plane ou accrocher sur les murs ou les arbres de sorte que vous pouvez tirer . 3/8" AR500 Steel Target Hanger 2 X 4 Topper Hook. The top hook for hanging is 3/8" AR500 and the tube is A500 MILD STEEL. They do not make tubular steel in an AR version. Manufactured from new high quality AR500 steel plate and A500 steel tube made in the USA. A-21: Official NRA 200 Yard Decimal Small Bore Rifle Targets. Official NRA targets--note the. Official NRA seal on the bottom right. Official NRAbuff color target paper. Self Adhesive Targets. strikes reveal the bright background of the target. Product Details. Condition: New. Charlie's kaBOOM! A reusable premium rubber valve installed in a custom designed heavy duty cola cap that is used to pressurize bottles for target shooting or just making noise. The greatest reactive plinking target ever ! Umarex Demo. Dunk the bottle in water to check for leaks. HOW MUCH PRESSURE?. Unlike pop bottles that are standardized there's a zillion types of water bottles and many are different. But there's one more consideration with these adapters. 6 PADDLE RIMFIRE DUELING TREE ONLY . THERE IS A SLOT ON THE BACK OF THE TARGET FOR MOUNTING ON A VERTICAL 2"X4" PIECE OF LUMBER. YOU CAN MAKE THE TARGET AS TALL OR AS SHORT AS YOU LIKE USING LONGER PIECES OF 2"x4" LUMBER. They are great for smaller caliber rounds and can take multiple hits before needing to be replaced. Projectiles pass through this target easily, leaving a small pucker mark on the surface thus the semi self-healing aspect. AR500 8”X 12” Steel T-Rex Target Blemish . Condition is New. This target is a blemish meaning it could have inferior hole or edge quality. 100% safe to shoot and fun for 1000s of rounds. Arrive, and they will be flat again by morning--you may eat dinner in front of your favorite sitcom for one night. B-21X(SPEC): Special Red Center 25 Yard LE Silhouette Targets. Reduced from 50 Yard B-21X (~1/2 size), Reversed (for improved sight picture), w/Red Center. (Le 11-avr. -19 à 16:47:25 Paris, le vendeur a ajouté les informations suivantes 1 Piece T arget Sticker. Adhesive targets stick to almost anything. Each target has 16 cover up round patches for more shooting. ). The Langdon Tactical Pistol Skills target was designed to allow shooters and firearms instructors to shoot several drills and or several relays without having to change targets. The design is a collaboration between Ernest Langdon and John M. from the LA Sheriff's SEB team. AR500 Steel Target Gong 1/2" X 2"
1/2" AR500 Steel Target. -Manufactured from new high quality AR500 steel plate made in the USA. 2" Gong Style Target. -Targets are not painted. They will be in raw steel form. -Minimum distances from steel targets to shooter are 10 yards for pistols and 75 yards for rifles. Charlie's kaBOOM! HOW MUCH PRESSURE?. Unlike pop bottles that are standardized there's a zillion types of water bottles and many are different. Screw the Cap on any Cola bottle and inflate to 90-100 and shoot! Manufactured from new high quality AR500 steel plate made in the USA. 2" Gong Style Target. -Minimum distances from steel targets to shooter are 10 yards for pistols and 75 yards for rifles. 3/8" AR 500 Steel Armor Plate Target. These are Official NRA competition targets. Manufactured from new high quality AR500 steel plate made in the USA. 4" Gong Style Target. -Targets are not painted. They will be in raw steel form. 3/4" AR 500 Steel Plate Target. -Minimum distances from steel targets to shooter are 10 yards for pistols and 75 yards for rifles. This sale is for a lot of four (4) each of the pictured item, an Official National Rifle Association International 50 FT. Slow Fire Pistol Target on 10-1/4" High x 8-1/4" Wide x. 0090" Thick Manilla Board. Printed on Official NRA Buff Target Paper. Type: Bullseye. 10 Pieces Rubber Bullseye. Material: Rubber. 8”X 1/2” AR500 Steel Target. All that's wrong with these is the Orange center is discolored (They Said). NOTE SIZES! THESE ARE NOT 23X35!! SECONDS FROM THE PRINTER! PRINTED IN THE USA! Your just poking holes anyway right?. 150 Assorted Animal Paper Shooting Targets Set 1. You will receive 25 of each of the following Targets. Rifle Scopes. In Your Sights is a market leader of good value and high-quality shooting and hunting gear globally. 35 Human Silhouette Targets are 23x35 official Police Size B-21. They are great for Concealed Weapons Permit Classes, Ranges, or Backyard fun! Whether you're shooting Pistols, Rifles or Archery, these are great targets! Manufactured from new high quality AR500 steel plate made in the USA. 2" Gong Style Target. -Targets are not painted. They will be in raw steel form. 1/2" AR 500 Steel Armor Plate Target. -Minimum distances from steel targets to shooter are 10 yards for pistols and 75 yards for rifles. Shooting /Archery Targets. Print your own. Over 700 printable targets for shooting / archery. Suitable for air rifle (.22. 177) Airsoft, BB, Archery. Print your own Targets. Literally hundreds of different targets to choose from.